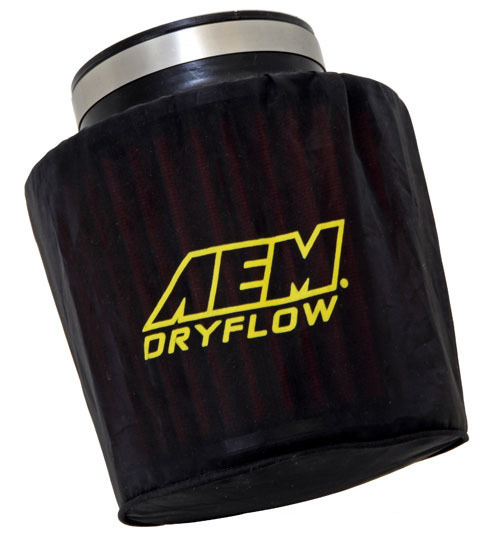 AEM DryFlow Pre-Filter Air Filter Wraps are designed to keep mud and water away from the air filter element. It minimizes the chances of these contaminants from clogging up your air filter, which lowers your engine’s performance, and keeps it from entering your engine, which can cause catastrophic damage. The durable micro-screen material minimizes air restrictions so that your aftermarket filter can still perform optimally and deliver the extra performance expected from it. The filter wrap is also treated with a proprietary hydrophobic process that keeps it from getting completely soaked in water – making it an ideal solution for off-road use and extreme weather conditions. AEM DryFlow Pre-Filter Wraps are available in a variety of sizes, so make sure to check the listed specifications before ordering to ensure it will fit your intended application. For 24 years, AEM products are consistently “Engineered to Outperform” competition. AEM Electronics reinvent manufacturing principles to create revolutionary products for your engine management systems. The company is continuously leading the industry in cutting-edge product technology because they heavily invest on intensive research and development applied in their high-standard manufacturing processes. So when it comes to Advanced Engine Management, nothing does it better than AEM. And by the way, that’s what AEM stands for. Before manufacturing performance electronics parts, AEM is the pioneer in producing the best quality cold air intake systems in the market. It also became the industry expert in manufacturing air induction systems. And the brand’s standards in air filter technology had been the basis of other aftermarket and performance brands for its superb air flow dynamics for ultra-high power boosting abilities. AEM performance electronic products are designed by racers for racers. AEM engineers perfectly know what you exactly need to showcase performance maneuvering inside the race track. In fact, AEM products have been used by professional racers in Bonneville, Drag racing, Off-road Racing, Road Racing, and possibly all automobile races you could ever think of. AEM performance parts probably had been into more racing competitions more than any other professional and amateur racers. AEM parts already landed pages of several recognized automotive magazines and websites like Road & track, Motor Trend, Super Street, and many more. And they’ve all testified to the quality and performance AEM products bring into your ride. AEM Electronics stores powerful parts to provide all your engine management needs! These performance parts allow you to virtually make all complex and simple adjustments in your vehicle’s data. Recent revolutionary innovations from AEM provide the perfect combination of performance, quality, and value for your diesel or gas powered racing vehicles. All of its products are loaded with features and functionalities to get your most desired power boost throughout the entire RPM range. If you only care about horsepower and torque, AEM exactly care about the same things. And it doesn’t end there. Having additional power makes you crave for a lot more, and AEM will give you just that. While this AEM DryFlow Pre-Filter Air Filter Wrap might fit your vehicle, unfortunately we can't guarantee fitment. Please read description and specifications to decide if this part is right for your vehicle.